This is an update (with new information) and a correction to CSCOPE Curriculum Designer Employed by CCSSO Partner to Aid in Implementation of Common Core. In response to a couple of inquiries and comments as to whether Grant Wiggins is actually a ‘designer’ of CSCOPE, I decided to look further into Wiggins’ involvement to be certain that I’m not misleading or providing false information. Although the link I provided in the original post names Wiggins and several others under the title “Beginning and Background of CSCOPE”, it does also say “Research Base” directly above the list of ‘designer’ and ‘developer’ names. Someone pointed out that they believe this means the CSCOPE development team, after researching ‘best practice’ designs and strategies, chose to use those of Wiggins, McTighe, and others listed in the linked document, for the creation of CSCOPE — not that Wiggins directly contributed to CSCOPE by writing curriculum or designing lesson plans. That makes perfect sense, and I admit that the document I chose to link to doesn’t effectively back up my claim that Wiggins is ‘one of eight designers… of CSCOPE’. However, in light of information evidencing Wiggins’ involvement in professional development training for Texas educators both before and after CSCOPE was implemented, coupled with the fact that Wiggins and McTighe’s Understanding by Design® framework for curriculum, assessment, and learning was directly incorporated into the design of CSCOPE, I think it would be safe to say that Wiggins had a hand in the design of CSCOPE, and further add that it appears he had a hand in its implementation as well. With over 1,600 lesson plans at any given time (some conveniently disappearing) and rumors of plagiarism, who can say for certain whose lesson plans or content is being provided through CSCOPE? If CSCOPE was created using Wiggins’ design framework and he provides professional development to Texas educators that use his design framework, why would it be out of the question for CSCOPE to contain lesson plans created by Wiggins? 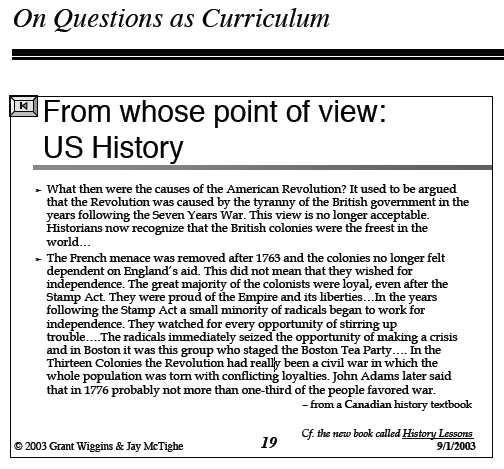 The sample lesson below uses ‘questions as curriculum’ and was created by Wiggins and McTighe. Compare this to the CSCOPE lesson that referred to the Boston Tea Party as an act of terrorism. This lesson plan looks like something that could have been used to teach students at Flour Bluff Intermediate School in Texas that the U.S. may have been a target for terrorism on 9/11 because we hurt other countries by making bad decisions. • Was George Washington any different from Palestinian terrorists trying to protect their country? • Was Jefferson a hypocrite? Did he really think of a slave as a sub-human while writing the Declaration of Independence? Here’s an essential question — With Wiggins acting on behalf of the CCSSO and Pearson to aid educators in implementing Common Core, how can we not expect lessons like these to become the national standard? An update and correction to this post can be found below. Grant Wiggins, one of eight designers of curriculum, standards and instruction of the pro-communist Texas CSCOPE curriculum, also provides professional development to aid educators in implementing the national Common Core State Standards. Pearson, the education service company widely known for publishing textbooks, has partnered with the Council of Chief State School Officers in providing training and other resources to states implementing Common Core. Through the ‘Pearson Common Core Institute’, Wiggins provides instruction via several Pearson Common Core webinar videos. 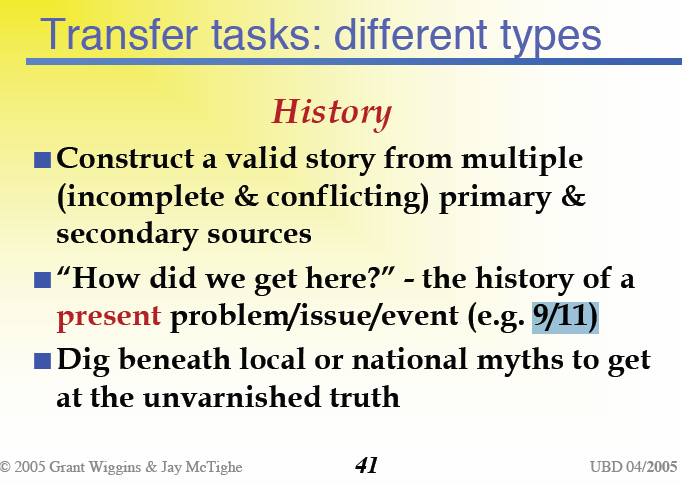 In one such webinar, Wiggins discusses “how issues of backward transfer relate to the Common Core”. ‘Backward transfer’ (also commonly referred to as ‘backward design’ or ‘planning backwards’) is part of the Understanding by Design® framework for curriculum, assessment, and learning created by Wiggins and co-author, Jay McTighe, also a designer of CSCOPE. As explained here and here, the Coalition of Essential Schools (CES) is the Bill Ayers backed progressive education reform movement behind both CSCOPE and Common Core. Linda Darling Hammond, developer of both CSCOPE and Common Core, has worked to implement CES reform for many years. 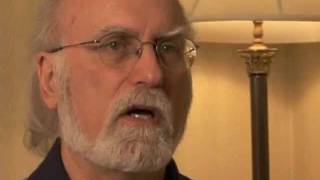 Grant Wiggins has worked with the Coalition of Essential Schools for many years, studying CES method and pedagogy, and incorporating them into the creation of his own curriculum and instruction design for use in CES schools. A staple of the CES reform model has long been the use of ‘essential questions’ in identifying desired results of teacher instruction. Stage one of Wiggins and McTighe’s backward design process is identifying essential questions. In 2011 and 2012, the Council of Chief State School Officers (CCSSO) partnered with ASCD (the Association for Supervision and Curriculum Development) to hold statewide summits in several states on the implementation of Common Core. Wiggins and McTighe’s Understanding by Design® was originally published by ASCD. 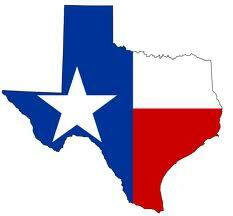 Read about Texas ASCD’s involvement with the Coalition of Essential Schools and CSCOPE here and here. Also, read more about Wiggins and others behind the Coalition of Essential Schools at Name Names — The People Behind the Largest Progressive Indoctrination Movement in the U.S.
Update / Correction — CSCOPE Curriculum Designer Employed by CCSSO Partner to Aid in Implementing Common Core. As I wrote here, Texas ASCD (Association for Supervision and Curriculum Development) is linked to the Coalition of Essential Schools (CES), a nationwide progressive education reform movement that, as a matter of practice, indoctrinates students in a racist, pro-communist, anti-American environment and curriculum. In an apparent attempt to fly under the radar in Texas, the Texas ASCD website does not specifically refer to Theodore Sizer’s Coalition of Essential Schools (CES), as does the national ASCD website. In fact, a few pages that did connect Texas ASCD to other progressive organizations are now no longer found on the internet. Texas ASCD’s website does, however, name many progressive educators that can be directly connected to CES schools. Howard Gardner – partner with CES founder, Theodore Sizer, in the creation of Atlas Learning Communities, a CES partner organization. Heidi Hayes Jacobs – curriculum designer for CES schools. Pedro Noguera – educator who has partnered with Theodore Sizer and CES on many programs and initiatives. H. Lynn Erickson – consultant to CES mentor schools and other schools and districts for the implementation of CES reform. Grant Wiggins and Jay McTighe – consultants to schools and districts for the implementation of CES reform. Robert Marzano – research and consulting to schools and districts regarding the implementation of reform, including the CES reform model. Interestingly enough, five of the Texas ASCD professional development keynotes listed above (Jacobs, Erickson, Wiggins, Tighe and Marzano) are also developers, along with Linda Darling Hammond, of the Texas CSCOPE curriculum. Linda Darling Hammond is a board member of the Coalition of Essential Schools Bay Area location in Oakland, CA (now named the National Equity Project). Each of these people also work for progressive organizations to implement Common Core State Standards. The largest private funder of CES schools, the Bill and Melinda Gates Foundation, is also the largest private funder of Common Core. Gates also funds several organizations, including ASCD, to support implementation of Common Core standards. Read about the connection between President Obama, Bill Ayers, and CES schools here and here. Also, see other radicals involved in CES schools at Name Names (where a new radical will be added each week, including state representatives, school superintendents, and school board members).